Libby's Little Addiction: November My Monthly Hero - Release + Giveaway! November My Monthly Hero - Release + Giveaway! Hello!! It's my favorite day of the month - Hero Arts release day! Yay! November's My Monthly Hero is another fun one, perfect for making Christmas tags and other goodies for the holidays! Today I'm sharing a card I created using some of the optional add-ons introduced with this month's release. Today's card features a super sweet new stamp set called Winter Animals. It's a bunch of animal silhouette stamps. There are several bears, which I adore - I chose this handsome fella who's out enjoying the winter evening. I watercolored a strip of watercolor paper using my Daniel Smith paints, then die cut the shape with the fantastic new Tag Frames Infinity Dies. These are so useful - I'll be reaching for them all the time!! The message from the set was embossed in white on black cardstock, then cut out in strips. 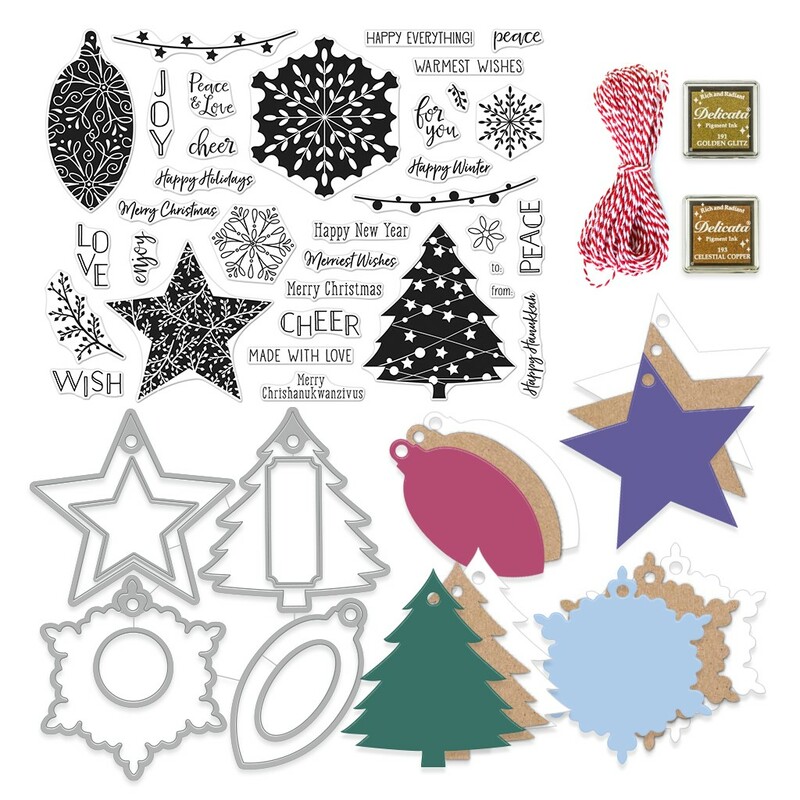 Snowflakes were added in unicorn white ink - the snowflake stamp is from another new set, Holiday Badges. My good ol' Stickles made a nice snowy ground, and I finished off the card with some sequins from the Frost mix. I love that it includes little stars! In case you missed it, I also created a couple tags this month - they were on the Hero Arts blog yesterday. 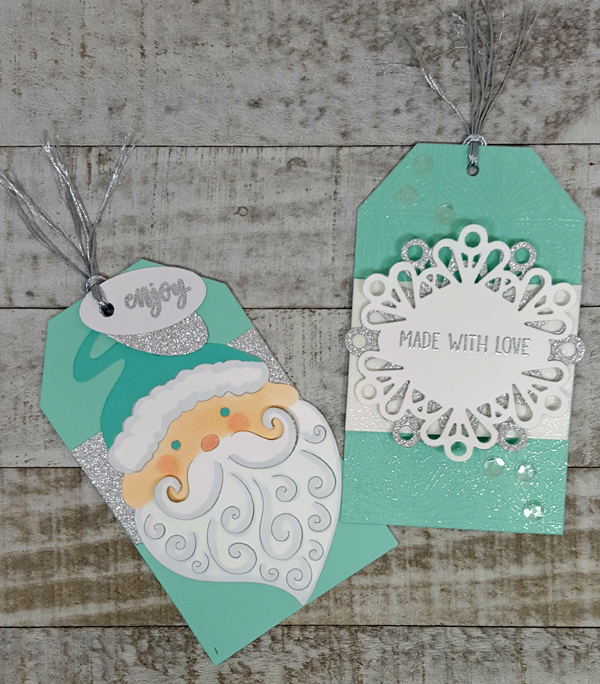 I used other new products - the Paper Layering Santa Tag, Snowflake Tag Fancy Die and the beautiful Snowflake Pattern Bold Prints - and I combined them with messages from the main kit. Be sure to check them out on the Hero Arts blog for more detail! And here's a closer look at the main kit, so much fun!! I created a few more projects with it - you can see them over on the Hero Arts website on the November page. And now, let's hop! Be sure to visit all of these blogs and leave comments - Hero Arts will be giving away one kit to a lucky commenter, selected from the comments left across all of the blogs in the hop. You have until Sunday, November 12 to get those comments in, and the winner will be announced at a later date on the Hero Arts blog. I'm the last stop on the hop - now head on over to the store and grab your kit before they are gone! The kits will begin shipping on November 10. Don't want to ever miss a kit? Subscribe! Thanks for sharing the cute bear card! Very cute card and thanks for the inspiration on making more than one at a time! Beautiful cards and love the tags, too! The sparkle on the cards is pretty. I really like how the tags came out. Very nice. Gotta love the bears!!! Such cute tags too! This is a great kit and you have inspired me. I love the color combo on the santa tag. Lovely. Beautiful tags love the santa. Thank you for your inspiration. Love the bears! Thank you for sharing your beautiful creations. I love all the sparkle!! Great color choices and sparkle! Love all your designs! These silhouette animals on pinks and blues are so sweet. Thank you for sharing. Your tags and cards are really cute. Love all the sparkle! The Santa card is gorgeous. Love the colors you chose. Very eye-catching. Those tags are so beautiful!! That Santa is driving me nuts! I can't wait to get him in the mail! The tags are my favorite - love that color! That was an interesting choice of colors to use on the Santa tag. Not sure if that was your intent, but it made it look more like an elf. Cute! Wonderful kit! I love the stickles snow across the bottom of the card. The Polar Bear standing is great! 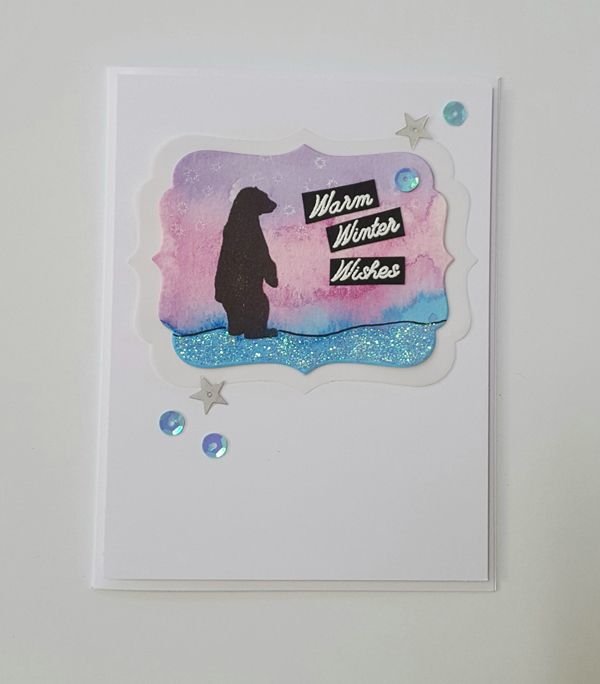 Very charming and pretty polar bear card. Love the stickles snow. Also love your tags. The Santa is adorable. Very cute and fun card, love the tags! Thanks for sharing! Thanks for sharing these cute cards! Great use of color and you can never have too much sparkle! So much inspiration, thank you. Waiting patiently for my kit. Beautiful! I especially like the tas! Awesome cards and tags! Love the bear silhouette, and the Santa and snowflake tags! Pretty colors and I like the sparkle. What a darling, walking bear! I love this card with the Northern Lights background! I didn't think I wanted this stamp set, but I'm now rethinking that. Lovin the glitter in your cards...Bravo! Oh my, Libby - your bear cards are off-the-charts adorable! I love the pairing of watercolored skies with the glitter! And your tags are wonderful, love the colors! Wonderful winter watercolored skies, AND very cool glitter! I love the beautiful blue color shimmer on the bottom of the cards. I love the color of the Santa! Your backgrounds are stunning, too! Your card is clever. I like the tags too. Beautiful cards & gift tags. I especially loved the gift tags! Love that Santa die. Beautiful tags! Thanks for sharing! I love the tags . Love how you used one of dies on the tag. Love the Paper Layering Santa tag. Beautiful cards, love the tags too. 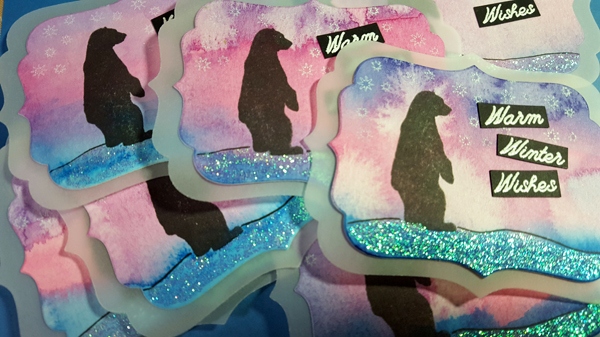 The polar bear is my fave and the sparkly details are so festive! Your cards and tags are fabulous! Thanks for sharing your steps to complete them! I love the set of cards and those tags are fabulous! Very cute tags. They are very festive. Also enjoyed seeing your cards. Thanks for sharing. I love the background you made for the bear ! And the Santa is super cute ! Two adorable project. I love the use of glitter on the card and the santa and snowflake tags. I love the colors. Using the teal for Santa, how original! Cute Santa tag. Thanks for sharing. The card and tag are great. Oh I love the tags. I never thought about making them in a non-traditional color. I have new ideas for this year's tags! Lovely 'die cut' for the cards. They're awesome on their own too. And fabulous tags. Lovely cards and tags! Thanks! The cards are adorable but the tags are gorgeous. Such great inspiration for the holidays. This kit is fantastic. Thanks for sharing your talents. Super cute. After checking a couple of posts on this blog, I left to add the silhouette animals to my kit order. They are so adorable, I fear they will sell out. Awesome! I absolutely love your bear cards! Great cards - love all the sparkling elements. Your tags are super too - love the colors. Thanks for sharing ! The colors on the warm winter wishes are wonderful! That Santa is my favorite, though! Love the glitter!!! Cool cards and yes I did saw your gorgeous tags earlier on the Hero Arts blog. Thanks for all your great work! All your Christmas creations are just gorgeous ! Beautiful cards and tags! I'm in love with the Winter Animal stamp set. Such a fabulous kit and products and I love that bear also! Thanks for sharing on the blog hop. Love your use of the watercolors to create the backgrounds. Love the polar bear! Love those winter animals & your card is perfect!! Great design. The tags are wonderful also! such fun and creative projects! thanks for sharing!!! Wow! Wow! Wow! Awesome card and tags!!! Beautiful! I especially love the tags! Love these cards and tags. So pretty. Thanks! Gorgeous creations! I love the tags! Libby, your cards and tags are so pretty, but I have to admit that Santa face is the cutest thing I've ever seen. Since I missed out on the kit, I think I "need" that Santa die! Wow! These cards and tags are gorgeous! Such cool backgrounds for your bears! Those silhouette animals are lot's of fun. I also really like those tags. Nice color choice. That Santa die cut came out very nice.